What Does a Broken Collarbone Feel Like? What Kind of Doctor Treats a Broken Collarbone? What Does a Broken Collarbone Look Like? When Should I See a Doctor About a Broken Collarbone? What Is the First Aid for Broken Collarbone? What Is the Aftercare for a Broken Collarbone? How Can You Prevent a Broken Collarbone? What Is the Prognosis for a Broken Collarbone? The clavicle (commonly referred to as the collarbone) is a bone found on both sides of the chest that connects the sternum or breastbone to both shoulders. A fractured clavicle is the medical term used when the collarbone is broken. 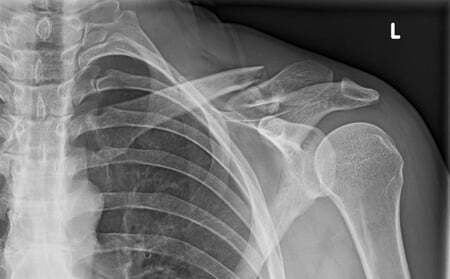 A broken collarbone can be caused by trauma (sports injuries, car accidents, falls, etc. ), genetically weak bones, or illness such as osteoporosis or cancer. The clavicle of a newborn may break during delivery. Symptoms of a fractured collarbone include a pop or click sound and feeling when the collarbone breaks, followed by sharp pain. The area will hurt when the arm is moved. The skin over the break may bulge outward, and there may be bruising. A broken collarbone requires medical care and an X-ray of the clavicle is usually needed. You may be referred to an orthopedic specialist for treatment. Treatment for a broken collarbone usually requires a sling or figure-of-eight splint to keep the area immobile for several weeks. In some cases, surgery may be required. Most clavicle fractures heal within 4 to 8 weeks. Physical therapy may help with rehabilitation. Occasionally during delivery of an otherwise healthy baby, the forces involved in trying to deliver the baby from the mother can break the collarbone. This is the most common bone broken in babies is during delivery. This is usually detected in the hospital, and the baby recovers well. Even more rarely, a physician may have to break the infant's collarbone in order to deliver the baby safely. This only occurs when a process known as shoulder dystocia develops. There are many other techniques available to overcome this, so it is rarely practiced today. The collarbone is the most commonly broken bone in childhood. These breaks are usually the result of falling directly on the shoulder or on an outstretched arm during play or sports. They can occasionally be the result of a direct blow to the collarbone, such as during tackling in football, or being crosschecked during hockey or lacrosse. Broken collarbones in adults can occur from the same sports activities that cause similar injuries in children but are usually associated with automobile accidents and falls. Occasionally, a patient that has a seizure will fracture the clavicle. When the collarbone actually breaks a pop or click can often be heard and felt, and this causes sudden, sharp, stabbing pain. When the affected arm is moved, grinding or clicking may be felt and the further the arm is moved away from the body the more it will hurt. After the initial sharp pain, the area that is fractured will feel like a dull, constant ache that is made worse when the arm is moved or touched. A broken collarbone most often causes immediate pain in the area of the fracture. Some people report hearing a snapping sound. Most people tend to hold their arm close to their body and support it with their other hand. This avoids movement of the shoulder which would aggravate the pain. Despite the pain, some people, particularly younger athletes, can have a surprising range of motion of their arms following a broken collarbone. The shoulder of the affected side is usually slumped downward and forward due to gravity. If the clavicle is gently touched along its length, pain is usually greatest at one point, locating the break. Often a crunching feeling is noted over the break, known as crepitus. The skin over the break often bulges outward and can be discolored a reddish-purple, indicating an early bruise. The first doctor you may see when you suspect you have fractured your collarbone is an emergency medicine specialist in the Emergency Department of a hospital, or your primary care physician (a general practitioner, family practitioner, or internist; a child may see a pediatrician). These doctors may make the initial diagnosis and then refer you to an orthopedist or orthopedic surgeon for further treatment (a doctor who specializes in injuries to the bones and joints). Anyone with a suspected broken collarbone should be taken to see the doctor as soon as possible. This way, proper diagnosis and treatment can be assured. The bone is poking through the skin or looks like it will poke through the skin. There is an associated numbness, tingling, discoloration, or pain in the arm. The person has any difficulty breathing. The injured area is rapidly swelling. The doctor will take a brief history to determine how the injury occurred. If necessary, a thorough physical exam will be conducted to evaluate for any other injuries. Specifically, the shoulder will be touched and inspected to identify signs of a broken collarbone. The nerves in the arm will be tested to make sure no injury has occurred there. Also, the doctor will listen to the lungs to make sure they were not injured by the broken collar bone. An X-ray of the clavicle is usually ordered to determine what type of break occurred. Sometimes, the break can be very difficult to see on X-ray, and several views of the shoulder may be needed. The doctor usually can show the patient the fracture on the X-ray. In rare cases a CT scan needs to be performed to find the fracture. Recently ultrasound has been used in children to diagnose clavicle fractures. If someone has been in an automobile accident or suffered a similar trauma, and a broken collarbone is suspected, be cautious and do not move the person. There may be other injuries. Wait for appropriately trained emergency medical services personnel to arrive unless the patient is still in danger if they are not moved. If the patient must be moved, avoid movements of the neck, back, and injured collarbone as much as possible to avoid further injuries. If it is clear only a broken collarbone is involved, the most important treatment is pain relief. The arm should be moved as little as possible. An ice pack wrapped in a towel should be applied directly to the broken collarbone. Aspirin, ibuprofen (Motrin, Advil), and acetaminophen (Tylenol) are effective over-the-counter (OTC) pain relievers for adults; avoid aspirin use in children. A homemade sling can be formed from a large handkerchief, or towel, or from the triangle bandage found in most home first aid kits. Simply fold the handkerchief, or towel, in half to form a triangle. Then fold the triangle around the forearm with one pointy end toward the elbow and the other two ends can be tied around the neck. The elbow should be bent and supported by the sling across the chest. The vast majority of collarbone fractures can be treated with a simple sling. Sometimes a swath is wrapped around the sling to hold it to the body. Occasionally a figure-of-eight splint is used. This wraps around both shoulders and the neck to hold the shoulders back and up. Either method is appropriate treatment for the broken collarbone. Patients will be instructed to wear the sling at all times until there is no further pain with movement. This is usually 2 to 4 weeks for children and 4 to 8 weeks for adults. Commercially available slings can also be used. A cast or brace usually is not necessary. Patients will also be instructed to avoid the potential for further trauma during this time. Some patients may take OTC pain medicine, but others might require a prescription pain medicine. Follow up with a health-care professional until the patient is pain free; a few patients may require some rehabilitation. Clavicle fractures will heal properly with standard treatment. But, rarely, people may have problems with fractures near the shoulder end of the clavicle. These people are often referred to an orthopedic surgeon within 2 to 3 days after breaking their collarbone. Some may require surgery. After the initial visit and treatment, people with broken collarbones are seen by their doctor or health-care professional in about one week to check on their progress, and to determine if any complications have occurred. They are instructed to avoid contact sports for at least 6 weeks following the initial injury; some require additional time before the can return to "normal" activities. If a sling or figure-of-eight bandage is used, follow your health-care professionals instructions on how long to use these devices for the broken collarbone to heal. Over-the-counter pain medications and icing the injured area may continue to be used to relieve discomfort. If the bone does not seem to be healing on its own surgery might be needed. If the bone is not healing correctly and causing problems with range of motion of the shoulder physical therapy may be prescribed. Proper safety equipment during organized sports activity can reduce the risk of broken collarbones. Specifically, the use of shoulder pads during football, hockey, lacrosse, and other similar activities is recommended. Always wear your seatbelt when driving or riding in a vehicle. Many young athletes are able to resume playing their sport within 6 to 8 weeks of the initial injury. Occasionally a bony prominence lasts in the area of the original break. The most common complication is failure of the bone to heal properly, but this is rare. Pain lasting after 6 to 8 weeks should prompt a visit to a doctor (preferably an orthopedist) to check on the progress of the healing bone. In general, older people take longer to heal than younger people, and still may not be completely healed as long as 12 weeks after the original injury. Patients that require surgery usually do well, but complications of infection, non-union of bone, neurologic problems, and joint problems may occur. What was the treatment for your broken collarbone? How long did it take for your broken collarbone to heal? Please share your experience with a broken collarbone. How did you break your collarbone? What symptoms did you have with a broken collarbone? How was your broken bone treated, and how long was your recovery time?